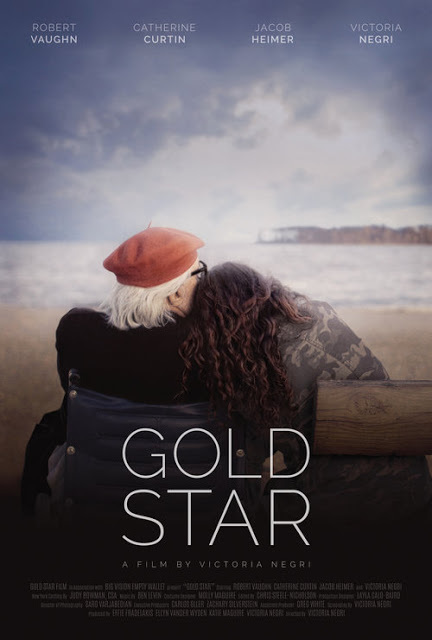 GOLD STAR (2017) is a loosely autobiographical independent film written and directed by lead actress Victoria Negri. The movie notably features the final performance of Robert Vaughn, who passed away on November 11, 2016. Negri plays Vicki, a young woman leading a frankly aimless life. A former music student, she has no career aspirations, marking time working the graveyard shift at an Anytime Fitness gym; meanwhile her relationship with her boyfriend (Max Rhyser) is increasingly revealed to be unhealthy. 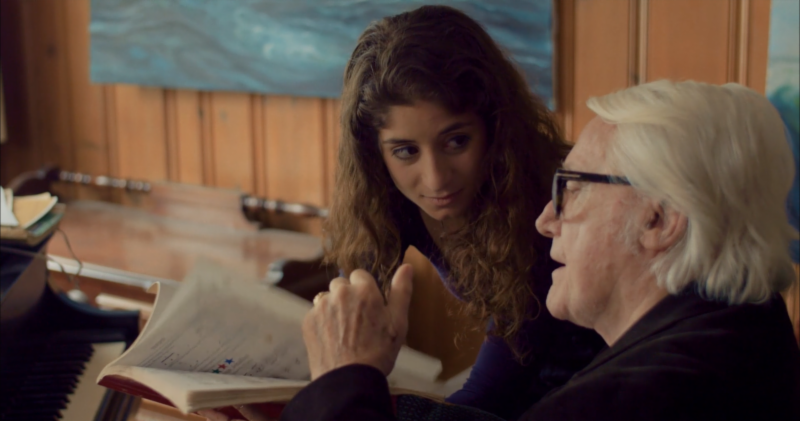 Vicki's life becomes more complicated and conflicted when her father Carmine (Vaughn) suffers a stroke which leaves him unable to walk or speak. Vicki's mother Deanne (Catherine Curtin) lovingly cares for her much-older husband, but she needs to return to work to help pay the bills. She naturally turns to the not-very-busy Vicki for help caring for Carmine. 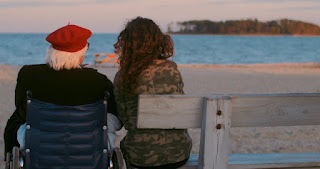 Vicki is at first distant from her father, awkward and at a loss to meet his needs, but she very slowly draws closer to him; along the way she learns compassion and begins to treat others with kindness, including her older half sister Maria (Anna Garduno). She also begins to confront her feelings that she's disappointed her father. I found it interesting that this is the second film I've seen this year, along with THE BIG SICK (2017), in which a real-life medical crisis provided the inspiration for a movie written by its lead actor. 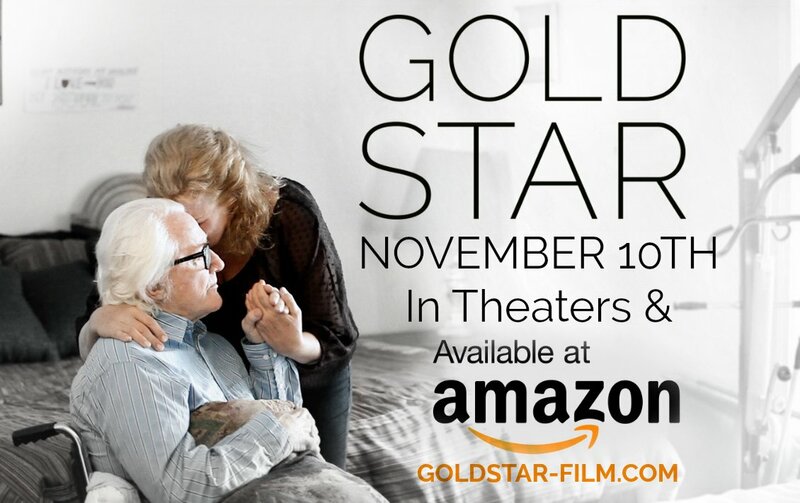 GOLD STAR is an absorbing film filled with recognizable moments and imperfect, relatable people coping with very challenging issues. Negri is brave in playing an interesting yet fairly unlikeable and unhappy young woman for much of the film. She's self-centered, with anger issues threatening to bubble and come to the surface at any moment, and she tends to hold others emotionally at bay; she has a more affectionate relationship with her mother than others, but even there they have some conflict and disagreement. Vicki is the dutiful daughter on the surface, but she clearly resents the demands on her time and does as little as she can get away with. With other people in her life, Vicki can be curt to the point of rudeness. Oh so slowly Vicki begins to turn things around, including ending a toxic relationship with her boyfriend, who's only interested in one thing from her, and it's not talking. On another front, while Vicki had initially tended to use her new friend Chris (Jacob Heimer) for car rides or to help bridge the awkward hours alone with her father, eventually she shows more concern for what Chris is going through in his own life and tries to show him support. Vicki also begins to build bridges with her sister, who has long-simmering resentment towards the "second family" living in her childhood home. As the film ends there is hope that Vicki has begun to put her life on track toward a more mature and positive future. I thought it rather daring to center the film around someone with so many issues, but it works; I remained interested in what was going on behind Vicki's impassive face and took heart in the breakthroughs she began to make as the movie came to an end. In addition to Negri's fine performance there is excellent work by Curtin as the devoted wife, exhausted and in need of emotional support, but determined to do the best for her husband; Garduno as the older daughter who is simultaneously annoying and sympathetic, desperate to hang on to mementoes of her past life with her father; and Heimer as the good-natured young man Vicki first meets at the hospital. 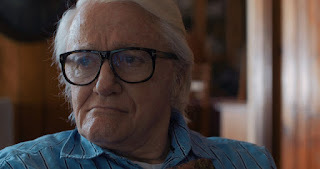 Best of all is Vaughn, who is completely and totally real as the father, communicating a world of emotions in a wordless performance. GOLD STAR was a touching and impressive cap to Vaughn's long career. While it may sound like a somber watch, the film's serious subject matter is leavened by brief moments of humor. It's also well paced and doesn't wear out its welcome; indeed, I was a bit surprised it came to an end at the 90-minute point. The photography by Saro Varjabedian is beautiful, capturing lovely Connecticut landscapes; at times it also dares to be different, such as the sun-streaked shots of Vicki and Chris through his car's front windshield. Parental Advisory: GOLD STAR does not appear to be rated but has a couple of fairly explicit "R" rated type scenes which are not meant for children. One unnecessary scene was frankly a bit much for me in an otherwise very worthwhile film; you'll know it when you see it. In recent months GOLD STAR has been playing on the festival circuit. It will be available to stream on Amazon beginning November 10th. In Southern California, GOLD STAR will screen theatrically at the North Hollywood Laemmle Theatre on November 20th. In Boston, my friend Raquel Stecher will be hosting a screening with Victoria Negri and composer Ben Levin at the Capitol Theatre in Arlington on November 27th. Raquel reviewed the movie at her blog late last year; she's put several good new films and documentaries on my radar screen in the past couple years, and this is one of them. I especially appreciate her help connecting me with Victoria Negri. The GOLD STAR trailer is available at the Hollywood Reporter. Check out the film's website for additional information. Thanks to Victoria Negri for providing access to an online screener of this film for review. Great review Laura. I felt such a personal connection with this movie especially since I had gone through something similar and I had a family dynamic that was very close to this one. There are not a lot of stories that touch upon what it's like to be the second family or to have a father who is much older. I found myself getting frustrated too with the main character and kept wanting her to figure things out then I reminded myself that I had a similar struggle when my dad's health was failing. I loved what you said about capturing the Connecticut landscapes. It really does have a great sense of place! Thank you, Raquel! It's very interesting that you felt especially close to the family dynamic portrayed in this film. This is a movie which has stayed with me since I saw it the other day, and I'm very glad i had the opportunity to see it. I hope the screening in Boston goes wonderfully! Looking forward to watching it this afternoon--enjoyed the review! Thank you, I hope you find it an interesting watch!